I spent much of my weekend in the van. Driving and listening to my kids watch The Sound of Music, which is a long a** movie. A movie I might have called cheesy once or twice in my life. But I have a whole new appreciation for it now. Tim left for work (which is extremely rare that he works on a Saturday) early and would be gone all day. The kids and I set off on a mini adventure. Something very outside of our norm. 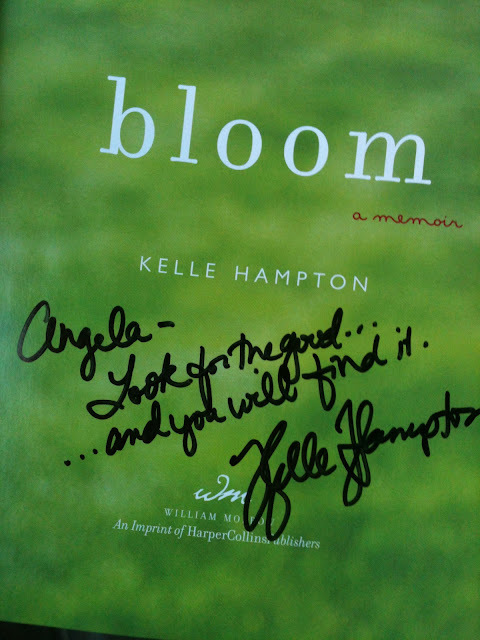 I gathered up all my little chicks and we went to a book signing of an amazing blogger, Kelle Hampton. I used to be the mom that went anywhere with three kids--grocery stores, movie sets (once I dragged all three kids to watch Miley Cyrus and Kelly Preston get out of a car for a scene they were filming, it was awesome! ), political rallies (okay, it was potluck type fundraiser, but rally sounds cooler) and road trips (my biggest claim to fame is driving to Tybee Island, Georgia, which is a hell of a long way from Michigan, with three kids while I was seven months pregnant). I loved being that mom. I loved being with my kids. I loved being capable, confident and self-reliant. Since having my fourth baby, I haven't been that mom. I stay home more. I stopped taking solo trips with the kids. It was too much. I sort of lost my mojo. But this past Saturday was different. As a treat, for being good sports, I let the kids watch a movie in the van on the way to the event. We normally reserve movies in the van for long trips. The kids rifled through the stack of movies and decided on The Sound of Music. I haven't seen or listened to that movie in gosh, maybe 15 years. Sure, I've sung my share of Do-Re-Mi's and Favorite Things while the kids roll their eyes, but no movie. As Maria sang about having confidence to leave the nuns, I too was feeling confident. There was a long line. It was outside. It was hot. "Really mom? You are going to make us wait in this long line?" But the kids were really amazing. We talked, the older ones roamed a little, Wade sat in the stroller and played with his cars. It worked. And I got a chance to meet someone that I think is pretty damn cool and inspiring. Lucy played photographer and took our picture. What a great message. Look for the good. 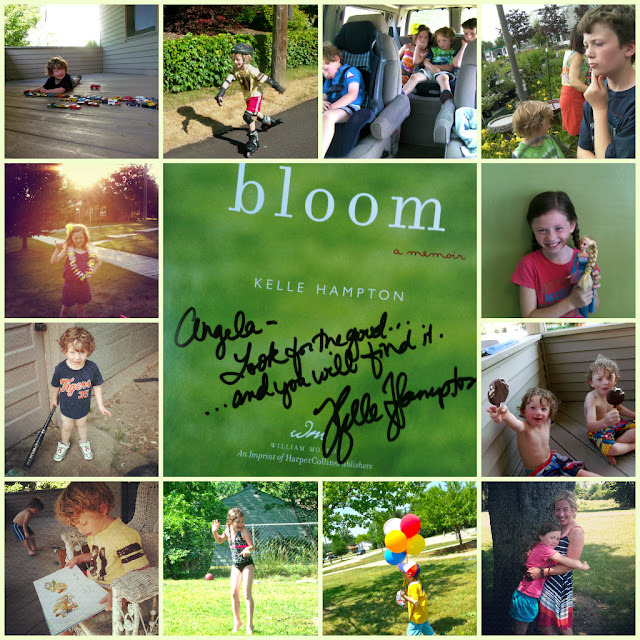 Click here for more information about Kelle's book "bloom." As we drove to our next destination, Maria was singing about the hills being alive with music and I was feeling it. I was alive. I could handle it. Could my mojo be back? After a quick lunch and dip in the pool, I loaded up the kids in the van again to take Lucy to gymnastics. As the yodeling "The Lonely Goatherd" song was blaring in the van and the kids were transfixed, I was distracted. I had received a text from Tim that was, well, bothersome. Tim and I fight like a couple obnoxious reality stars, except we don't get paid (whomp, whomp) and no one is watching (thank god). When we are really exhausted, usually on a Friday night after a long week, we have been known to be a little overcritical, nit-picky and sensitive. Okay that's just me. Tim just gets annoyed with the whole scene. Well this particular Friday night, I might have said a few really bad words and made a really horrible scene. I might have. Usually after a fight, Tim and I will look at each other and realize "holy hell, we're tired, sorry" and move on. But not so this weekend. Tim was still very much annoyed. And I was still very much the over-sensitive soul. As Maria taught the kids to sing "So Long, Farewell," I was imagining worst case scenarios and feeling very sorry for myself. 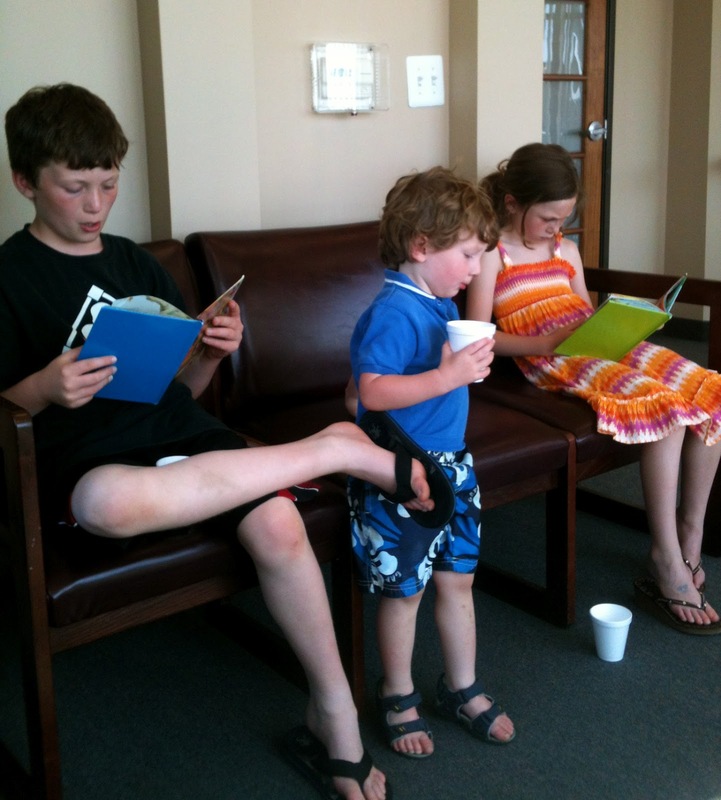 Off to pick up Lucy from gymnastics, take JT to a birthday party and Wade to the doctor. Baby Wade had been such a trooper, but his fever came back and with the bad earache he'd had a few days before, I was worried. The poor kid ended up having a double ear infection and had to have his ears flushed. I got back in the van and the movie was at the part where Maria is questioning her life, a little scared of it all. The head nun (sorry if that is incorrect terminology) sang to her and told her to "climb every mountain, chase every rainbow." I was cheering Maria on in the front seat. I might have teared up a little. Before I started driving I sent Tim a text basically begging for forgiveness and almost accepting full responsibility. Almost. I mean come on, our poor baby just got his ears flushed and Maria was leaving her dream of being a nun to be with the man she loved. Tim and I could get over a little fight. Tim forgave me, we all had a great evening together as a family. Sigh. Life was good again. Just like Maria and the Captain and all those von Trapp children. We were together and happy. I was back in the van driving to a birthday party with the kids. It had been a great morning and all seemed right with the world. The movie was still going and again another perfect-for-the-moment song came on. "Something Good" is about how Maria feels that damn, she must have done something right in her younger life to deserve all this. Well, Rodgers (the guy who wrote the song), you nailed it. I must have done something good for all the good that I've got. And I'm getting mine back. Congrats on the mojo. And happy birthday!